The center of the Forest Hills community and the golf course in the 1920s, the clubhouse would become a school, a library, and a community center in subsequent lives. Had a Sweet 16 here in September. Great Price for the space and time we were there. Has a kitchen and gives that country club feel without the country club budget if you know how to do it right. Very Pleased! Will use again and have recommended to others. Hi J, Im trying to have a party at the Forest Hills Clubhouse, but I can't find their contact information! would you happen to know where I should call or to email? Thanks! This historic building is located in the heart of the Forest Hills neighborhood and offers a large meeting room, a spacious kitchen, restrooms, heat, air conditioning, and a large lawn. The clubhouse will accommodate 80 people and is perfect for a business meeting, team building retreats, parties, anniversaries, church functions, and family reunions. Call the reservation office at (919) 560-4355, ext. 27202 for availability and rental rates. I was wondering if this place is for wedding receptions? I'm getting married June 7, 2014 and I have been looking for places for a reception to hold 150 people. Any help would be greatly appreciated. For one thing, I'm thrilled that the city saw fit to renovate this building. This article leads one to believe that the whole building at one time was a library-only the small room in the wing to the left was the library (in front of what was and may still be the kitchen). Other wing was an apartment for the caretakers of the park. Rest of the club house was a community center with a tiny library (abt 300 square feet). The library was there from 1946-1992 when Southwest Branch (now Southwest Regional) was opened. I spent many, many happy days working in that tiny library from the mid 1980s until Southwest was opened. One photo has a pool. Is it closed? Forest Hills was developed as part of a new wave of real estate development in the 1920s - one that already recognized that how people lived, worked, etc. had fundamentally changed with the incredible adoption of the automobile. 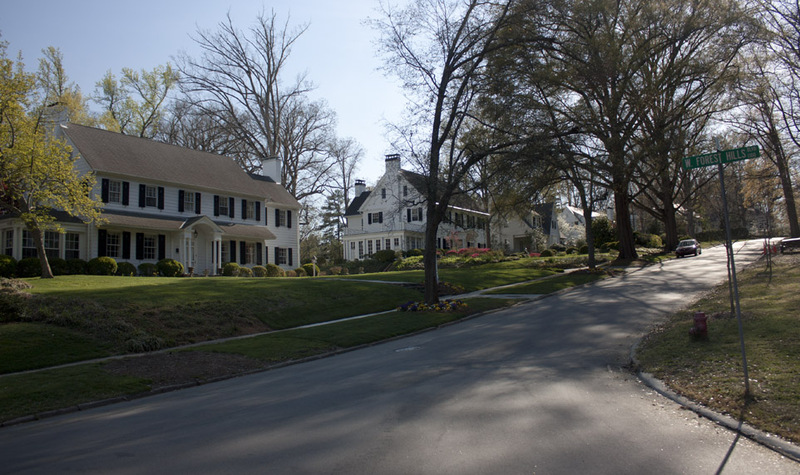 Much like Duke Park, Forest Hills was a geographically proximate suburb - although the houses and road patterns were different than those implemented in previous developments, the location was interconnected/adjacent to the earlier development of Morehead Hill and Lakewood. Unlike previous developments, and unlike Duke Park, there was a more self-contained plan to Forest Hills, with circuitous and circular drives, and the focus of the development on the nine-hole golf course and clubhouse at its center. The clubhouse was designed by George Watts Carr; per the Nartional Register nomination, the original clubhouse burned. This structure, minus the flanking, shorter, gable-front wings, was built in 1928. In 1929, the New Hope Realty Company decalred bankruptcy, and the course and clubhouse were purchased by John Sprunt Hill. The wings were added after this point. 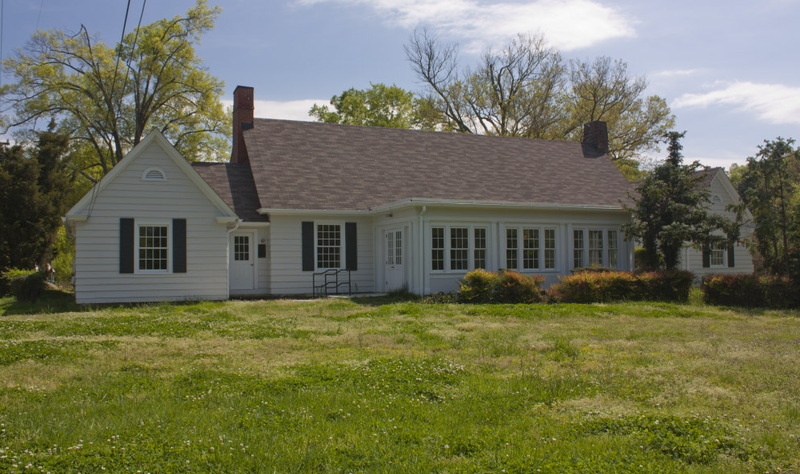 The clubhouse was the first home for the Calvert Method School, championed in Durham by Annie Hill, JS Hill's daughter-in-law. The school opened in the former clubhouse in 1933, and would remain in the building until 1938. It then moved to original George Watts house - located on South Duke Street. 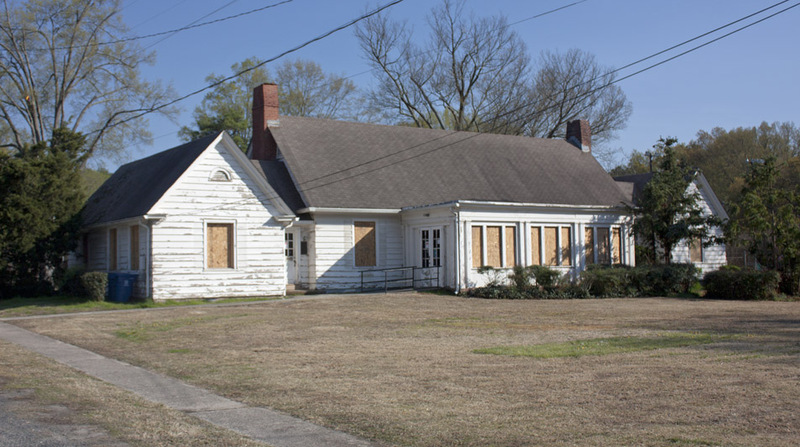 Hill deeded the park and the clubhouse to the city of Durham, stipulating that the clubhouse was to be used as a public library. 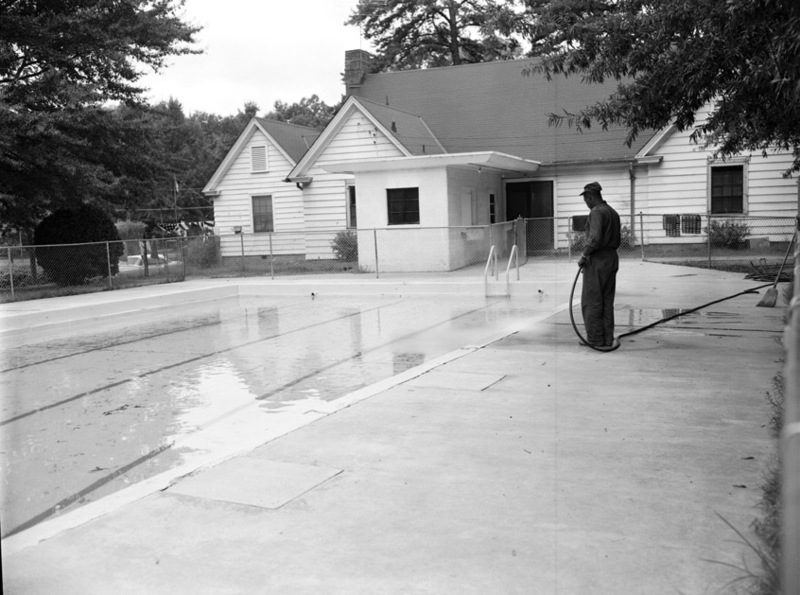 Pool at the Forest Hills Clubhouse, 1950s. The clubhouse became a community center (i.e. stopped being a library) at some point. I was wondering if this place is for wedding receptions?